Every day immigrants trek across the dangerous U.S.-Mexico border and are forced to find work here because jobs in their home countries are scarce or nonexistent. Free trade agreements like NAFTA, globalization, neoliberalism, the outsourcing of jobs and small businesses, the exploitation of workers and a U.S. foreign policy that puts profits before people’s needs are a constant reality for immigrant families in their home countries. Immigrant men and women become undocumented workers in the U.S. in order to support their families back home, hoping someday that they and their loved ones will be reunited. Too many times the presence of immigrant workers in the U.S. is characterized as breaking the law. But the truth is that many immigrant workers just want what’s best for their families and especially their children. And there is nothing criminal or illegal about that. 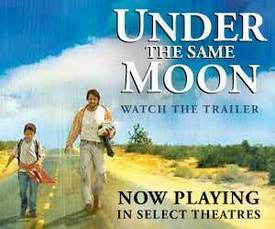 The new film “La Misma Luna” (Under the Same Moon) tells the emotional and heartfelt story of a mother, Rosario (Kate del Castillo), and her nine-year old son, Carlitos (Adrian Alonso). Rosario, a single mother originally from Mexico, leaves her son to come to the U.S. as an undocumented worker in order to send money back home to support him. Carlitos lives with his grandmother in Mexico and hasn’t seen his mother, whom he misses dearly, in four years. He looks forward to talking with her every Sunday. Rosario tells Carlitos that whenever he misses her, he should just look up at the moon. She says she will do the same, because however far apart they are, at least they’re under the same moon. Tragedy strikes when Grandma dies in her sleep. Meanwhile Rosario, unaware of her mother’s passing, loses her job and is faced with hastily marrying a willing man who has his U.S. citizenship — a desperate plan and a way to be reunited eventually with Carlitos. Rather than live with the family of his father, whom he has never met, Carlitos sets out on a quest to be with his mother. He faces all the dangers any immigrant encounters trying to cross the border — physical peril, venal coyotes (smugglers), hiding from immigration officials and the local police, worker exploitation, homelessness and trying to adjust in a new and strange country, alone. On his journey Carlitos meets up with Enrique, an undocumented laborer. The two narrowly escape an immigration raid at a vegetable-picking farm. Initially Enrique, played by well-known comedian Eugenio Derbez, wants nothing to do with Carlitos. However, a charming companionship develops between the two and Enrique reluctantly takes Carlitos under his wing. Their adventure together and Carlitos’ determination to reach his mother details a very human story based on hope, love and resilience. At the end the audience is left with the idea that the real struggle in this story has just begun. Director Patricia Riggen, screenwriter Ligiah Villalobos and actress del Castillo, who plays Carlitos’ mother in the film, are all Mexican-born immigrants. The movie is all in Spanish with English subtitles. Let’s hope this movie will make people see past anti-immigrant rhetoric and allow us to internalize what love means, especially when it comes to a mother and her child.